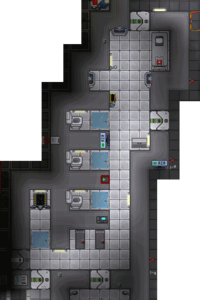 The toilets, tubs, and lockers of Cog2 have fused together to form...the Locker Room. Dumping Discount Dan's noodles and ProPuffs cigarettes into the bathtub for hobo chemistry. Soaking the nearby loofah into the contents of said bathtub to create a floorpill sponge of monstrous size and effect. Clogging the toilets with paper, action figures, jumpsuits, hats, and the bottle of Cap'n Bubs(TM) Extra-Manly Bubble Bath nearby. Giving grabbed victims swirlies in said clogged toilets. Welding the drains shut and living the showerheads on. Using the plunger...as a hat! There are no vents, but, sensibly, there are drains. The APC for this room in the maintenance area right of here. The Toilets are, as their name suggests, the NSS Destiny's restroom, located in the middle of the ship and right across the hall from the Bridge. It features, as it should, an array of classic porcelain toilets with lockable stall doors, as well as a Cyborg Docking Station for the needs of more robotic lifeforms. Remember, you can relieve yourself on the toilet by standing over it and either using the pee emote or say "*pee. Watch your step! Right below the toilets is a shower room, equipped with an array of hygiene-boosting shower heads and bathtubs. The personal lockers nearby are there to so you lock away your belongings while you bathe. The APCs for the Shower Room and Toilets are located in the Maintenance hallway west of it. The toilets and showers have packed up. They're roommates with the lockers in the Locker Room now. The loo. The potty. The crapper. The porcelain throne. The Great White Round One. 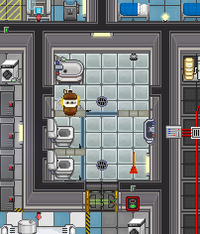 Whatever you call it, this Toilets room above Crew Quarters A is still one of the station's many bathrooms, alongside the ones in the Brig, Engineering, Medbay, Research, and the Shower Room. 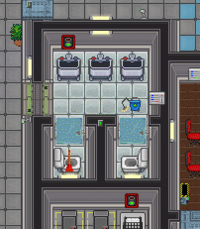 As you'd expect, this room is absolutely vital for maintaining proper hygiene for Goon RP#1 players. For the Goon #2 crowd though, there's plenty of things to do besides welding the drains and leaving the showers on. Cook up meth and bath salts in a bathtub! Give a monkey a swirlie! Stash secret booze and kush caches in the toilets! Even though you can't crap in here anymore, you can still do a crapload of things. There is no vent. Hold your nose when you're in here. The APC for this area is in the room on the left, near the wardrobe. Between the Crew Lounge and the Bridge territory of United Command is a hidden kingdom called the Bathroom, inhabited by three sinks and a cleanbot and ruled by two porcelain thrones with many names. Citizens all over the region of Atlas flock to here as a vacation spot, where they often cleanse themselves with the sinks and visit one of the thrones, typically either by using the pee emote or entering say "*pee. There is no vent. The thrones forbid vents, air injectors, and other members of the Atmospherics Tools clan after its nobles attempted to assassinate the throne. The APC for this area is on the right wall. This page was last modified on 31 March 2019, at 05:43.